Geta Bratescu was born in 1926, and she is still making art to this day. Not only does she work in her studio on a daily basis, but she also continues her work as an art editor for Secolul 21 [21st century] magazine, which she started working for when it was Secolul 20 [20th Century]. She is an artist whose work spans several decades, various genres, and different political regimes. When looking at the artist’s collages, textiles and assemblages, the playful element perhaps overshadows the seriousness of her work. But in her actions and performances, the seriousness comes to the fore. 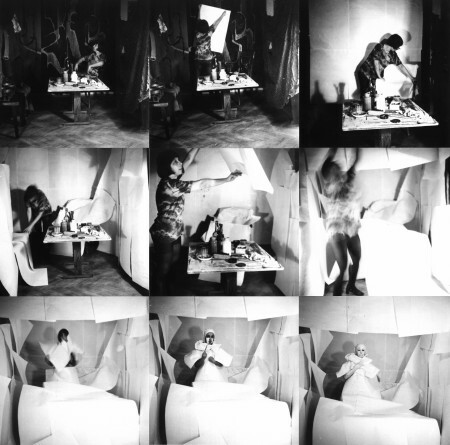 She spoke of her actions as an extension of her 2-dimensional work, since “the act of drawing is like a performance.” Working in her studio, much like her colleague Ion Grigorescu, the artist staged a number of actions for the photograph or film camera. She found the confines of this space not restrictive, but rather, she used the restriction of space to her advantage, explore the studio and her body within it to every possible extent. In Toward White (1971), for example, she covered the entirety of her studio in white paper, effectively erasing the space until she was all that was left – at which point she proceeded to cover herself in white and paint her face the same color, effectively dissolving into the studio space itself. Self-portrait toward White (1976) takes a similar approach, but focuses only on her face, which is erased gradually by placing transparent paper over it and layering the paper until it is no longer possible to see through it. While those actions were documented photographically, she carried out two in 1977 that were filmed by Ion Grigorescu: Hands and The Studio. The former focused on the artist’s hands as she moved them, gestured, and drew on and around them. Ileana Pintilie has commented that this piece could function as a self-portrait, and I think that all of these pieces that focus on her face, hands or body, and also those that feature the studio could equally serve this function – it is through the hands that the artist creates, and it is in the studio that she has the greatest freedom – artistic and otherwise. In The Studio we bear witness to that freedom as we see the artist sleep in her studio, wake, and begin her creative activity. The film is divided into these three parts, entitled Sleep, Waking Up and The Game. In the final part, we see the artist “play” by manipulating various objects, turning herself into a doll by pulling her collar over her head, and finally inscribing herself into a square, based on her own dimensions. She effectively carves out a space for herself literally, in the same manner in which the studio is a space carved out in society just for her. Her universe is based on her own proportions, and it is of her own making. This echoes what she told me about life under Ceausescu in Romania, stating that the only condition placed upon her was to not do anything political. Other than that, she felt she had “all other freedoms.” But living under communism was not the only challenge the artist faced. In the 1970s, at least, she was very much a woman in a man’s world. That said, Geta does not align herself with feminism, and even balks at the thought. Rather than feeling marginalized, she said, she “felt at the center” in terms of the art world. Her coping mechanism was similar to that which she used under the communist regime. Rather than fighting it, she “ignored the fact that it was a man’s world,” and just carried on with her work. Nowadays, I believe, she is an inspiration to a younger generation of artists, and it is no surprise as to why.